How Much Walking is Enough to Lose Weight? Walking is good for health but how much to walk? Of course it can’t be infinite! That will make you sick too. Studies say that a person with average stride walks 5000 to 5500 steps per day. One who dreams to lose weight must walk at least 10,000 steps a day. That is about 5 miles for the average stride. Now the big question- How to count steps? The answer is- let pedometer do it. 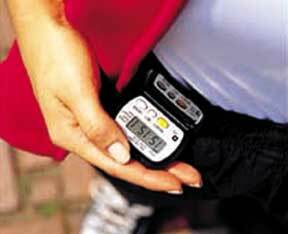 A Pedometer is a small, matchbook-sized device that is generally worn around the waist. Also known as step counter, it keeps a record of your steps through the movement of legs, more precisely by the impact of your foot upon the ground. The more advanced models even calculate the distances traveled by you and let you track your numbers over time. If you just want to count your steps, get the basic model. However, if you are also interested in measuring the walked distances and burnt calories and if you wish to upload your walking data or electronically track the numbers, get a more advanced model. Before buying a pedometer, ensure that you can easily read the data on display monitor, both indoors and outdoors. Always try to get a lightweight model that can be worn with your usual clothing. Ensure it has a sturdy clip and a security strap to hold the pedometer in place. Wear it in the morning and take it off before going to bed. It’s that simple! But make sure that your pedometer does not record other movements you make. Some of these instruments are made to record all movements and not just walking steps. If yours is one of these models, turn it off when you are not walking in order to get accurate count of your steps. Right at the beginning, establish your baseline steps. Wear your pedometer for the whole day long for three consecutive days. Calculate the number of steps for each of the three days and divide the sum by three. This will give you a baseline from where to start setting goals. At first, set short-term goals. Add a few number of steps daily to your routine or you may even double your baseline steps. Gradually, start setting long-term goals. For example, 6000 or more steps a day and take it to 10000 steps a day. Always set realistic goals- based upon your body stamina and health condition- remember every body has its own capacity! It is always good to add steps- walk a little more to lose weight. But how? I’ll help you a little by giving tips on how to walk more on daily basis. Park your car in the far back of the parking lot at work, malls and other places. If you travel by bus, get off the bus one stop earlier to your destination. Walk the rest of the distance. Take the stairs at office and at home. If yours is a high rise building, get off the elevator at the floor below your office cabin or home. Take the stairs for the rest of the distance. Always climb down the stairs. While making phone calls- walk and talk. Keep the remote control of your TV, AC, music system etc. deep in the cupboard. Use these appliances the old way. Walk to the TV to change channels. Walk to some or the other colleagues in lunch breaks to say hello to them. Take your dog or your neighbor’s dog for a walk. Don’t keep water bottle at your desk. Walk up to the drinking facility every time. Use the lavatory at your office that is furthest from your desk. Add more to this list and keep walking to lose weight and be healthy! In case you think running would be more beneficial and faster way of losing weight, you might not be completely wrong. But it is true for only some people, for others, walking is the best way to lose weight. Want to know why? Read Walking v/s Running for Weight Loss- What is Better?